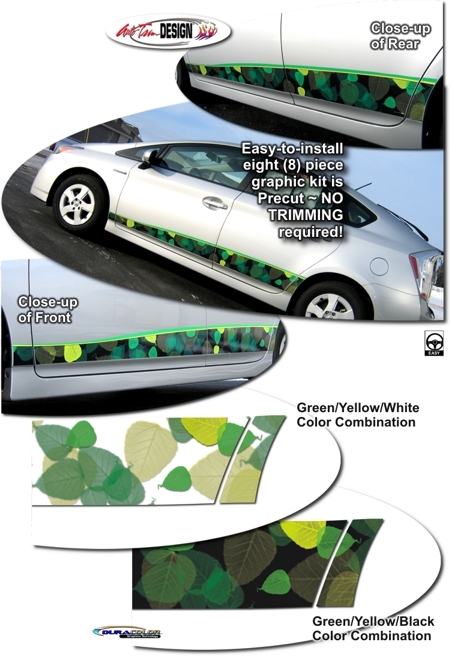 Being "Green" can be even more stylish with our unique ECO inspired body side graphics kit designed specifically for the '04-Current Toyota Prius. Utilizing various colors of leaves, pattern is nested over either a White or Black background. A highlight stripe of Green and Yellow is featured at the graphic top. Very easy to install, this kit is precut - NO TRIMMING required - and is set to be placed at the bottom of the doors as shown. Graphic kit is specifically made for the '04-Current Toyota Prius and will not fit any other vehicle.